Data and analytics have become table stakes for nearly every law firm of every size and scope. But not all firms utilize the data at their fingertips to their greatest advantage be it for internal efficiencies and talent acquisition; to shaping strategies at trial and maximizing value to clients. How do you know if your firm is making the most of its business intelligence? Ark Group’s 8th annual Business Intelligence & Analytics in the Legal Profession conference will give insight, actionable information and invaluable networking opportunities that will help you and your firm engage and breakthrough to the next level of business intelligence and data analytics maximizing results internally and with clients. How can you grow your practice using data and analytics? From organizing your firm to optimize your data and analytics for partners and staff alike, to creating systemic intake language to streamline results, there are ways large and small to refine and transform your firm for the next generation. Attendees of the conference will have an opportunity to learn from (and ask questions of) their peers concerning real-world applications of BI tools in a law firm setting—with a focus ranging from how to move past the billable hour model and enhance efficiencies and profitability, to how data and analytics can help you with recruitment, to next-level data visualizations that can help develop trial strategies. Through case study illustration, attendees will also discuss how data can classify risks and find opportunities; how to create a culture that supports innovation, how to demonstrate these abilities to enhance the client relationship and what the future holds for business intelligence. 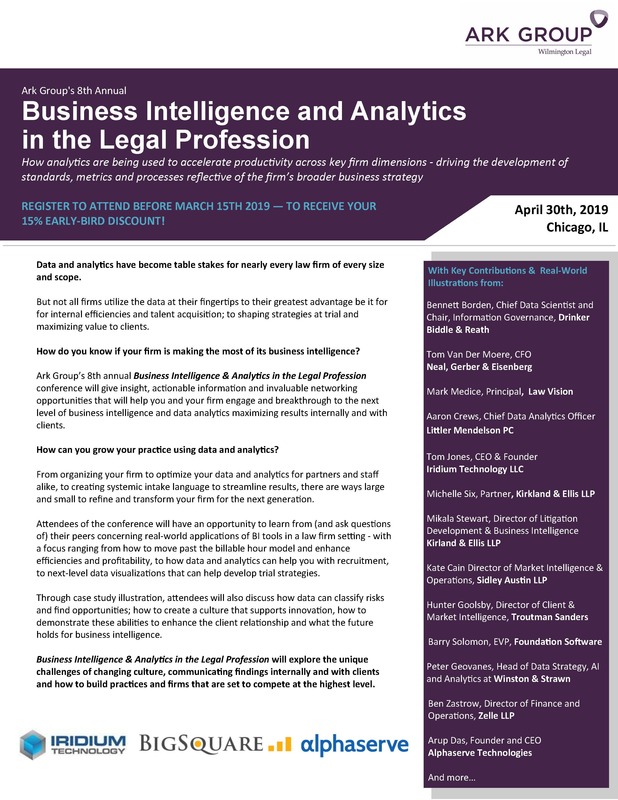 Business Intelligence and Analytics in the Legal Profession will explore the unique challenges of changing culture, communicating findings internally and with clients and how to build practices and firms that are set to compete at the highest level.